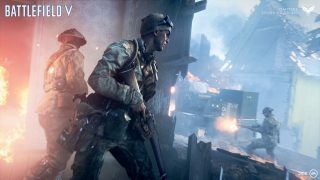 Catch our Q&A on what’s coming to Battlefield V including Combined Arms, Squad Conquest, a new Grand Operation, and the return of Rush. It’s a new year for Battlefield™ V. And a second Chapter for the game is about to strike. Whether you’re a player new to Battlefield V or a veteran, let's check out what it will mean to you. What is Chapter 2: Lightning Strikes? Continuing the evolution of Battlefield V, Lightning Strikes is the second Chapter of the game. So, what does a Chapter entail? They bring all kinds of new ways to play the game, through maps, modes, missions, and more – some exclusive to the duration of the Chapter, some permanent. When does Chapter 2: Lightning Strikes take place? The first Event of Chapter 2: Lightning Strikes will start on January 17. 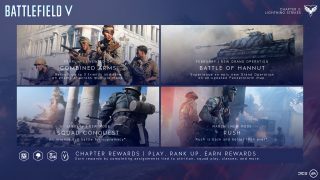 During the Chapter, new additions will be added to Battlefield V on a regular basis. If you don’t want to miss out, make sure to jump into the battlefield as often as you can during this period. What new content and features are in Chapter 2: Lightning Strikes? There’s a lot! A Grand Operation, Squad Conquest mode, the return of Rush mode, fresh Chapter Events with Weekly Challenges, rewards for completing them, a Chapter Rank to climb with further rewards, and various other additions are all coming your way. Unsure what all of that meant? See more below! What is the new Squad Conquest mode? Squad Conquest, available between January 17 and January 30, is a more focused and intense version of Conquest, the staple Battlefield mode where two teams fight for majority control over control points, which (along with kills) will drain the other team’s respawn tickets. The team that reaches zero tickets will lose. In Squad Conquest, there are only two four-man squads on each team and you can only spawn on your HQ, not on flags. Discover more details about this exciting mode in our Squad Conquest article. What can you tell me about the return of Rush? Available for a limited time only in March, Rush is the return of a classic. 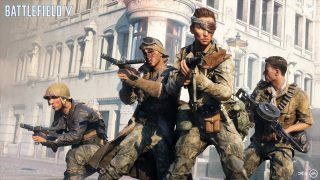 This game mode first arrived in Battlefield™: Bad Company, and in Battlefield V, the rules are more or less the same. Your objective depends on whether you’re on the attacking or defending side. Attackers have a limited amount of respawn tickets and need to arm two bombs before the respawns run out. Defenders need to do whatever they can to stop this explosive plan. Rush will be available on the maps Twisted Steel, Narvik, and Devastation. Why are these modes only available for a limited time? 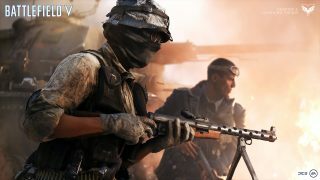 Battlefield V is constantly being evolved and defined through community feedback. We want to see how you react to Rush and Squad Conquest before making them a permanent addition. If you enjoy the modes, we will look at bringing them back. What is Combined Arms and when will it be released? Coming in February, Combined Arms is the Battlefield V co-op experience, where you can improve your skills before taking on multiplayer. In your first Combined Arms endeavor, you’ll attempt a surgical strike on a single objective in eight missions. As we come closer to its launch, we'll share more details on Combined Arms. What can you tell me about the new Grand Operation? As you may know, Grand Operations is the ultimate Battlefield V multiplayer experience, set across different modes and maps and taking place over up to four in-game “days” of fighting, with each day affecting the conditions of the next. Set on the Panzerstorm and Arras maps, a new Grand Operation called Battle of Hannut is coming with Chapter 2. On the French and Belgian countryside, you must give it your all in Airborne, Breakthrough, and – for the first time in a Grand Operation – Rush mode. If the match is even, an extra in-game day will be triggered, and you’ll play Final Stand – a mode where resources are slim and respawns don’t exist. Are there general game tweaks coming with Chapter 2? Yes, we’ve deployed several fixes and tweaks with the first Battlefield V Chapter 2: Lightning Strikes Update. For instance, we’ve improved combat and death experience through killcam and damage visualization improvements, and the issue with Career Rank 50 players who weren’t earning Company Coin is being worked on. Read our summary article of this update for info on tweaks to weapon balancing, maps, vehicles, and more. What are the Chapter Events in Chapter 2: Lightning Strikes? They are called A Few Good Soldiers, Hold the Line, Iron Skin, Armor on the Horizon, and Unstoppable Force. Except for the one-week long Iron Skin, they are all two weeks long. Get great tips on how to complete the Weekly Challenges of the first Chapter Event. What is Chapter Rank and how do I earn it? Chapter Rank is a special rank which shows how active you’ve been in the current Chapter. It’s only available during the active Chapter and can be earned by simply playing the game. However, the rewards of the Weekly Challenges will earn you a big chunk of Chapter XP, helping to make climbing of the ranks a faster process. Learn more in our article about progression. What rewards do I get for earning Chapter Rank? For each time you rank up, you’ll get a reward like a weapon/vehicle customization skin, a Dog Tag, an emblem, or a Special Assignment. You'll find some great examples of this in our article about the Chapter 2 progression. I didn't get all the rewards from Chapter 1: Overture. Can I still get them? All Chapter 1 gameplay items, such as weapons and vehicles, are now available to unlock with Company Coin in the Company menu. However, the Chapter 1: Overture visual customization items like soldier, weapon, and vehicle skins are currently not available. What new weapons and vehicles are available in Chapter 2? You’ll get to wield powerful weapons like the Zk-383 submachine gun, the Modele 1944 semi-automatic rifle, and the M1922 MMG. On the vehicle side, you’ll get the chance to obliterate enemy armor with powerful Tank Hunter vehicles – stay tuned for more details about these as we get deeper into the Chapter. There’s more coming in the latter part of the Chapter, but we’ll keep some of them a secret. When are these weapons and vehicles coming and how do I get them? Some weapons, like the three mentioned in the question above, are rewards for completing the Weekly Challenges, meaning, they will be unlockable after these challenges are live and as soon as you’ve completed them. Other content, like the Tank Hunter vehicles, will be added to Battlefield V in later updates during Chapter 2. What new Reinforcements are coming in Chapter 2? The mighty Reinforcements – resupply crates, special vehicles, or rocket attacks that can be called in by a squad’s leader – will be getting two fresh additions with Chapter 2: Lightning Strikes. These are the Sector Artillery and the Smoke Barrage. There you have it. We hope you'll enjoy Chapter 2: Lightning Strikes and the way it transforms Battlefield V. Make sure to explore all the new ways to play, climb the ranks, earn rewards, have fun, and crank up the volume as lightning strikes the battlefield.